All cases are archived on our website.� To view them sorted by number, diagnosis or category, visit our Home Page and click on the Case of the Week button on the left hand side. Thanks to Dr. Mowafak Hamodat, Eastern Health of Newfoundland and Labrador, St. John�s, Canada, for contributing this case. To contribute a Case of the Week, follow the guidelines on our Case of the Week page. 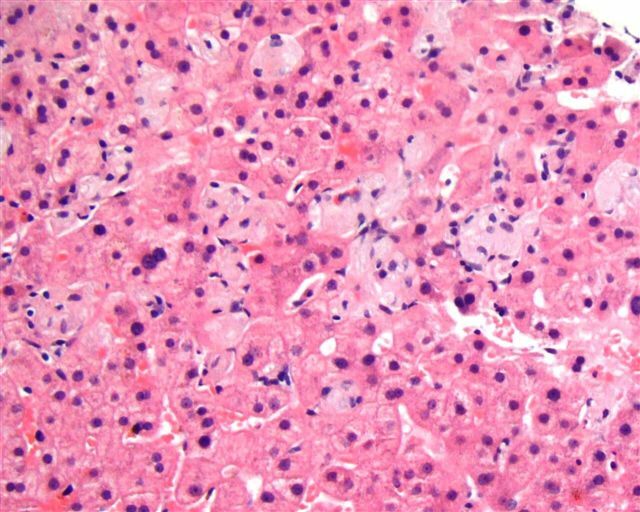 A 51 year old man presented with chronic liver disease and �feeling unwell�.� He had splenomegaly with thrombocytopenia and elevated liver enzymes.� A liver biopsy was obtained. 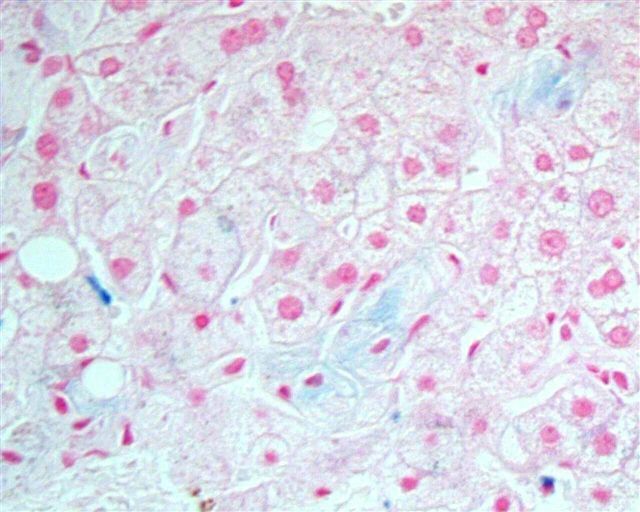 The liver biopsy showed enlarged Kupffer cells and diffuse infiltration of liver parenchyma by histiocytes, which showed crinkle paper type cytoplasm. �Electron microscopy showed angulated lysosomes. Gaucher disease (preferable to Gaucher�s disease) is a lysosomal storage disease caused by an autosomal recessive mutation in the β-glucocerebrosidase gene (also called glucosylceramidase and β-glucosidase).� The highest risk group are Ashkenazi Jews, in who 1 in 15 are carriers.� The defective enzyme leads to an accumulation of glucocerebroside substrate in cells of the mononuclear phagocyte system, including histiocytes in the spleen, lymph nodes, bone marrow, GI and GU tracts, as well as Kupffer cells in the liver, osteoclasts in bone, microglia in the CNS, and alveolar macrophages in the lungs (Arch Pathol Lab Med 2008;132:851). 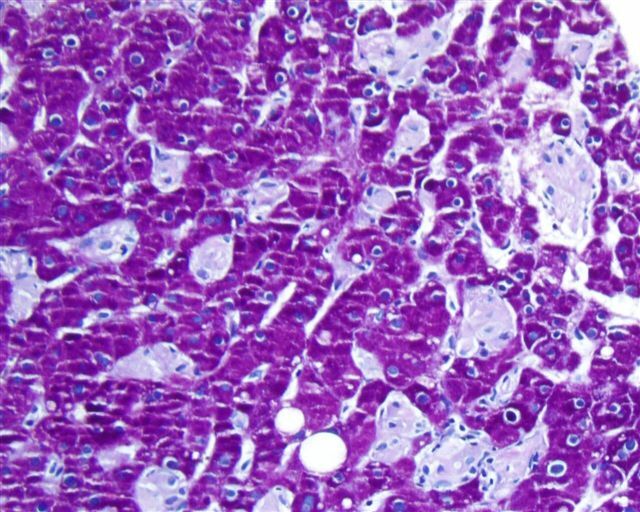 The diagnosis can be confirmed by measuring glucocerebrosidase activity in peripheral blood leukocytes.� A finding of less than 15% of mean normal activity is diagnostic.� The enzyme activity in carriers (heterozygotes) is generally half-normal, but may overlap with healthy controls.� Molecular analysis, particular in Ashkenazi patients, may also be helpful. 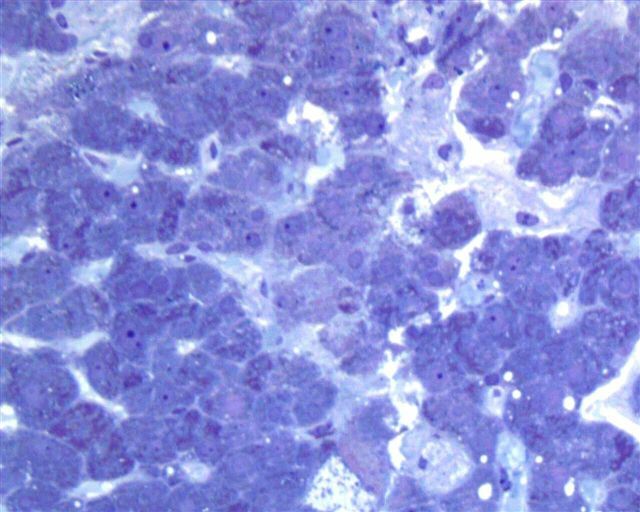 Gaucher disease is divided into three clinical subtypes. 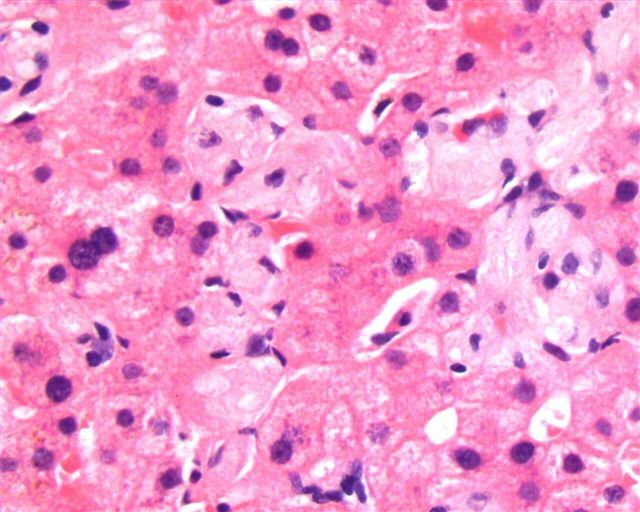 Type I is non-neuropathic and may be mild in severity.� Type II, or acute infantile neuropathic Gaucher disease, affects infants within a few months of birth and is usually fatal within 2 years.� Type III is a chronic neurological variant, with onset anywhere between birth and adulthood, and presents with a slowly progressing neurological decline (eMedicine, Wikipedia). Symptoms of all three types may include splenomegaly, hepatomegaly, hypersplenism, osteoporosis and a yellow-brown tint to the skin.� Anemia is also common.� Patients with types II or III may have seizures and dementia.